Ideas and inspiration to share your knowledge gifts with the world. Learn about the latest products for your creative tool chest. Maintain a rhythm in your creative projects and in your life. General chit chat, news and some possible blathering. I took part in NaNoWriMo, National Novel Writing Month, last November. Well, actually, I took part in spirit. Technically, I joined Nina Amir’s NaNonFiWriMo – her November writing challenge dedicated to non-fiction writers as NaNoWriMo is more for writers who want to complete a fiction novel. It’s a great opportunity to be able to write in November with 1000s of other writers, while sharing in a community of non-fiction writers. All this to say… I finished the first draft of my book! In November. Yes, yes! So now begins the fun of editing it. I have let the first rough draft “simmer” the past few weeks, just letting it rest from all the brain dumping that I did in November. I have given it until mid-January before cracking it open. And now the time has come to dive in and start my revisions! I’m very excited about this new project and will share as much as possible about it here on the blog. My project of self-publishing a non-fiction book will unfold here, right before you eyes. The decision to self-publish was very simple for me to make: I want full control over what goes into my book and the timing for releasing it. I will share my lessons learned (both good and bad) in case you might have some good stuff you are thinking about writing as well. Oh, another thing! 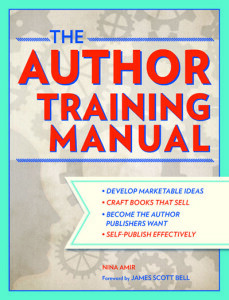 I won Nina Amir’s book, The Author Training Manual, which I plan to study while working on revisions (especially Step #6: Decide If Your Book’s Content Matches Your Initial Vision). Pretty exciting to win this book as I’m one of those people who never wins anything! Thank you Nina! So there it is! I’ve laid out my project and I’m using my blog to hold myself accountable. Yikes! What have I done? In my next post I’ll share what I’m using as my project notebook to keep everything organized. Have you self-published a non-fiction book before? I’d sure like to hear about it. Please share in the comments. What is a Perfect Project? A perfect project is a project that that you have completed on time and without spending more money than you planned to spend. You were able to get the project completed by the time you promised or by the time you dreamed of having it done. You also estimated the exact amount of money that you would need to spend or you spent even less. In a perfect project you are feeling pretty darn awesome at the end. 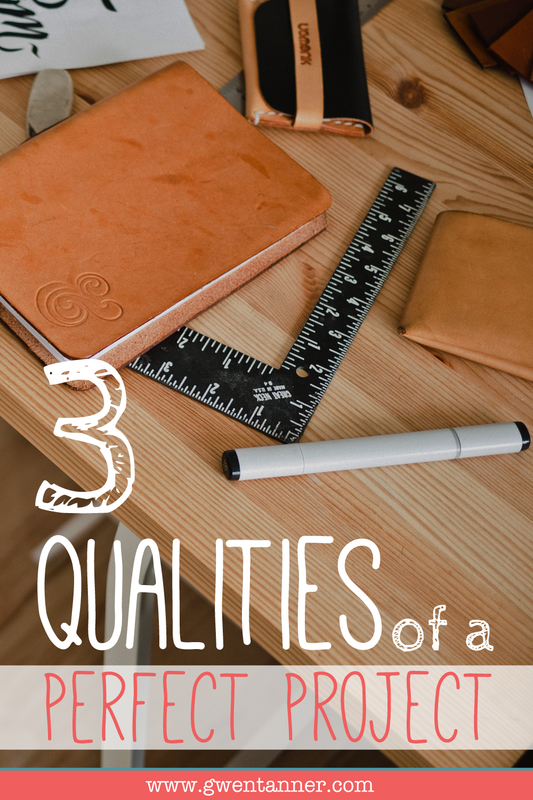 Here’s the rundown of the three qualities of a perfect project. When planning your projects you always dream that you’re going to be able to get it done in the amount of time that you have (either due to your own schedule or someone else’s requirements), while maintaining the quality that you desire and without having any issues or problems or other things that can stress you out. In a perfect project, you finished on time or even a little earlier. Your final product or service was A-MA-ZING! There may have been a few hiccups in the process, and they might have slowed down your progress a little, but you planned your time carefully and you were still able to meet your due date! You didn’t spend more money than you planned, or better yet – you spent even less! You’re feeling really good about yourself for having stayed within budget or even having saved a few dollars. Typically, when you stay within the budget that you estimated for your project, this means you didn’t add in any extra goodies (e.g., “Hmmm, now that I see how this is looking, I think I’ll add in some gold-plating to make it more fabulous!”) or you didn’t have any “oopsies” that you didn’t account for (e.g. “How could I forget I needed to purchase boxes for shipping?!”). And that’s a big bonus! In a perfect project, much of the time (and I’m not saying all of the time or most of the time, but much of the time), the project runs very smoothly because you feel great about many of the tasks that you have to do. You definitely won’t enjoy all of the tasks, and that’s completely normal. However a perfect project is different for everyone as far as the tasks go. Some people will enjoy doing certain tasks for the project while other people will dislike those very same tasks. For them, if their task list or their to do list is filled with tasks that they don’t enjoy, the project may not be so perfect. For example, if my project were a fundraising event and I was tasked with asking people for donations, doing those tasks would not make the project so perfect for me because I would be simply miserable. Asking for donations is not something I feel great about. However there are some people who really enjoy a big task of reaching out to others, selling their idea for fundraisers and getting donations and there is a huge sense of accomplishment when doing that task. If their to do list is filled with those type of tasks, then they are feeling great much of the time! Same project, same tasks – perfect for some, not so perfect for others. If you managed to fill your project task list with work that you felt great about, and you finished on time and on budget – congrats, you had a perfect project! Even though we want to feel great while completing our projects, it’s important to think about the true end game. What is it that you really, really want at the end of the project? It could mean that you want a sense of accomplishment, perhaps you want recognition or perhaps you just want to get paid! In the case of a project that you felt stressed out until the very last day – a sense of accomplishment or recognition or a pay check could make it all worth it! At the end of a perfect project, you’re feeling AWESOME because you got what you wanted! Of course, not all projects are perfect. And sometimes there are consequences that we have to pay for taking too long or spending too much. Proper project planning does help to ensure your schedule and budget are realistic and that you are doing tasks that you enjoy. We will talk about project planning in future posts. 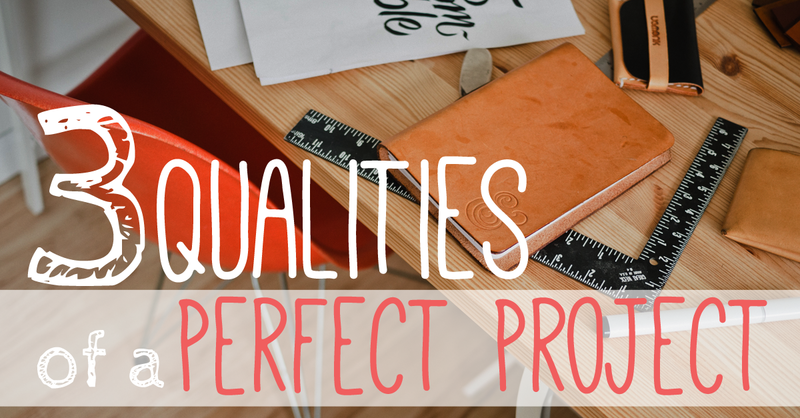 Can you think of a project that you felt was perfect? Please share in the comments below. If you are stuck in a rut with getting your project complete, it may be time to step back and examine what type of project person you really are. Knowing this may give you some clues about why that project remains petrified in your lengthening list of to-dos. The project person with laser-focus is pretty darn amazing. She focuses on only one project at a time and bowls threw her long list of tasks to get that project complete. She loves checking off the boxes of the completed tasks. Having all those checkmarks next to a long list of to-do items is very motivating. Once her mind has been set to complete her project, you better believe it will get done in the most efficient way. She’s got those super distraction blockers and they work so well! The struggle: Although once she gets started, you can’t stop her, she will often need help pulling things together. Things need to be perfectly in place, all ducks in a row, before she can get started. She gets caught up in over-researching, over-planning and over-thinking, in order to make her well-oiled machine perfect so that she can start (can you say procrastination?). She always needs more information – because how can she know exactly what needs to be done, if she doesn’t know what she doesn’t know? I like to think of the project person with no focus as an innovator. She can work on multiple projects at once, but she knows her limits on how many projects to take on at a time (usually one or two or even three). While she is working on a project, she gets so many ideas about how to make it bigger, better, prettier or faster. She is the go-to person when you want to know how to enhance or embellish ideas and add new features to an otherwise boring project. The struggle: With so many innovations, comes many more tasks. The no-focus project person keeps coming up with so many new ideas for her project that the project gets larger and larger and larger. Every new idea leads to a new feature and every new feature is bigger and better than the last! As her project gets larger, it gets more overwhelming. She can get started on her project, but she won’t know when or how to finish. This project person is truly inspired…by everything. With a wild imagination and curiosity, the all-over-the-place project person is a project start-up superstar. She has so many ideas for new projects that are useful, interesting, unique and just plain fun to do. Her mind races daily about new ideas and how she can get them started. She enjoys having a variety of tasks to work on that support her many interests. The struggle: She is such an idea machine that she really doesn’t have time to procrastinate or plan. She is ready to start up the next project…until another more important project gets her attention. She never spends time over-researching or over-planning, in fact, she may not have a plan at all. The all-over-the-place project person never needs to worry about her projects getting larger and larger, because she can never focus on one long enough! Whenever a new ideas comes along, it must be started immediately – even if that means dropping all of her other projects. 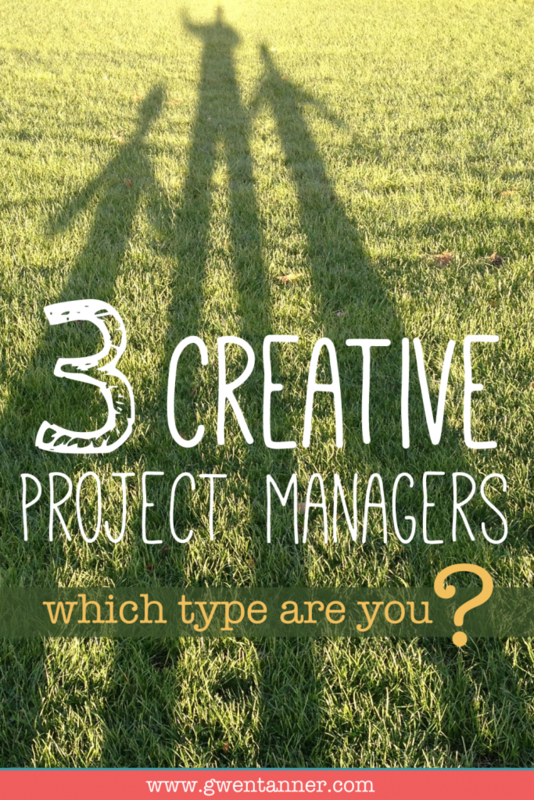 Do you identify with one of the three types of project people? I’m sure you relate to one, mostly, but also find that you have the tendencies of all of them. For example, I define myself as the All-Over-the-Place Project Person. I currently have about 15 or 16 projects in my project binder. Most of them are in progress in some way or another, but it’s sad to say there aren’t any that are complete. However, I do see characteristics of myself being laser-focused at times. Plowing through a list of tasks for a project is pretty easy for me if it’s something I have to do (like working with a contractor for repairing a door) versus something I’m inspired to do. Now, if it’s a project I’m very passionate about, I become more like that no-focus project person does. I get really into it and think of more and more ideas that can make the project even better. Recently, I have learned to tame that beast, slightly. I am able to determine a “scope” for a project and stick with it, not adding any additional bells and whistles along the way. Of course that initial scope may be HUGE, but I build that into my planning during brainstorming I’ve had to learn to be very selective when new ideas come. In a future post we’ll look at how each of these project people can get move forward on their perfect projects! 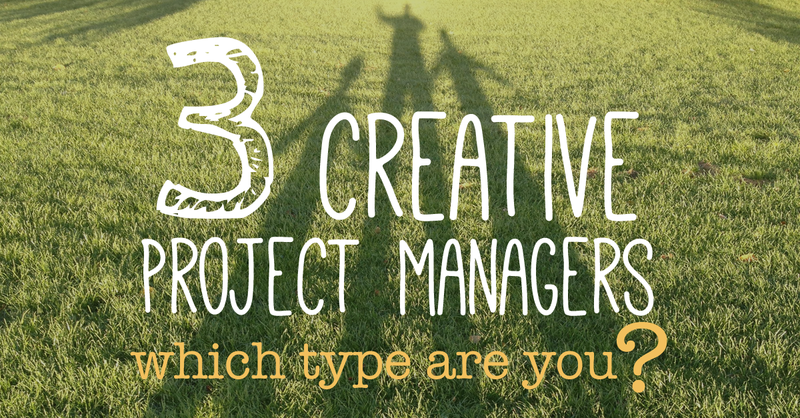 But for now, please share what type of creative project manager you are! Sign up for my Sharing Awesome newsletter!